54 days in. Eight days to go. Nine to eleven puppies inside. Penny had her x-ray this morning. The vet could count nine puppies but saw evidence suggestive of a couple more. Not only did we get Penny a maternity clip at her last grooming a month ago but she is also losing fur on her belly as she nears her time. 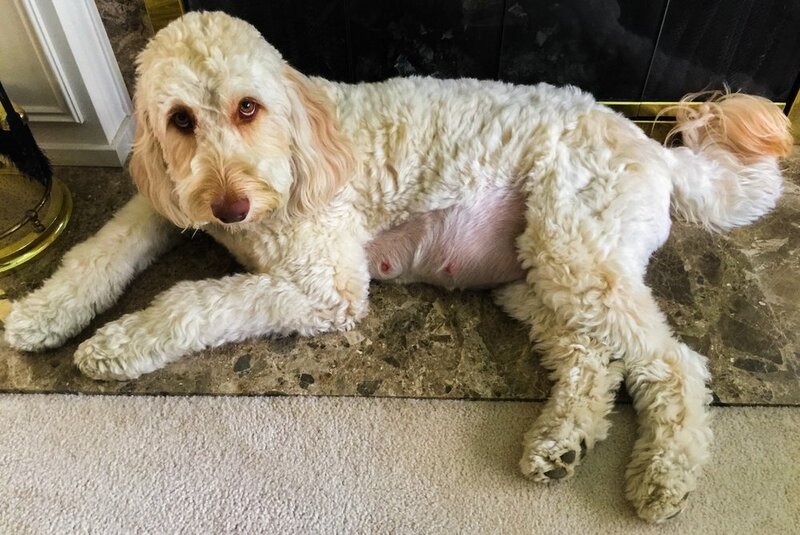 Placing a hand on her belly and waiting quietly, we can feel puppies moving inside. She loves the cool marble at home. She was pressing her belly to the cool floor while the vet showed us her x-ray and gave us last minute advice. We also checked her progesterone for the third time in a week. The numbers are falling steadily and look like they will remain high enough for the puppies to remain in mom for another week.